Club Karma in Seaside Heights. Officials are looking to shut down a club that served as a favorite playground of Snooki, JWoww, Pauly D and The Situation. Seaside Heights announced last week that they are seeking an injunction in New Jersey Superior Court to halt business at Club Karma. This week, it was reported that the borough may try and revoke the club's liquor license. The club was made famous on the MTV reality television show "Jersey Shore," which showcased a group of friends partying in Seaside Heights during the summer. The show was recently revived, filming in nearby Asbury Park and Point Pleasant Beach last summer and premiering this past April. Seaside Heights rejected a permit to film the show there again for the reboot. 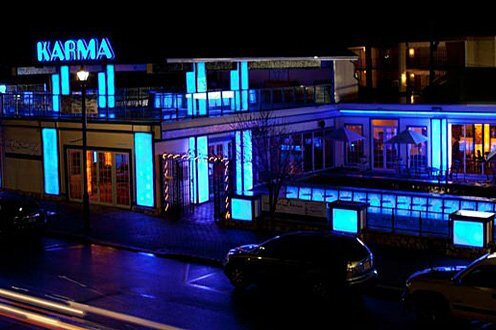 In the injunction filed May 23, the borough argues that Karma is operating as a nightclub, which is prohibited by borough code. The only bars and taverns permitted on the Boulevard are establishments that also have restaurant facilities and serve meals. Savor, the restaurant that previously operated on the first floor of the club, announced in April it wouldn't be returning in 2018. Despite not having a restaurant, Karma still advertised a dance party for Memorial Day weekend, the borough said. The borough's injunction attempted to stop the club from opening for the holiday weekend, but that attempt failed, as Karma's massive dance party went on. That party, according to borough officials, led to four arrests for underage drinking and six overdose calls, the Asbury Park Press reported. Borough Administrator Christopher Vaz told the newspaper he will now recommend that the club's liquor license not be renewed. But the club's owner, John Saddy, blamed police. He said he keeps patrons under 21 separated from those of legal drinking age, and that when police came to the club to frisk patrons, they opened a door that allowed minors to sneak into the over-21 section. "I am running the club the same way it’s been run for the last 15 years," Saddy said. "There is nothing different. Only in their minds it's different. The town is just coming after us. They called in all these cops for a bunch of kids dancing." "We don't want that kind of business," said Mayor Anthony Vaz, who has led a campaign to clean up the borough's reality TV image. "But it's not just that. We're looking at laws and enforcement of laws, which are not just ours, but on the state's books." Anthony Vaz, the father of Christopher Vaz, said last year that he understands the rebranding of Seaside Heights might take a while. But the future of Karma seems to be a big part of that push.